I've always felt it was too much effort to keep track of yields if a crop isn't harvested all at once, so I don't know for sure how much fruit our kitchen peach produced this year. My best guess is about four bushels, which is just about average for a mature peach and which feels like a lot. Since I ran out of freezer room (having saved some space back for more green beans and soup), I did a lot of experimenting with alternative preservation techniques (compared to our tried-and-true peach leather). I canned a load of peach chunks (which look good) and a load of peach sauce (in which I didn't leave enough head room, resulting in an eruption that ruined the seal on five jars during cooling). And then there were the jams. 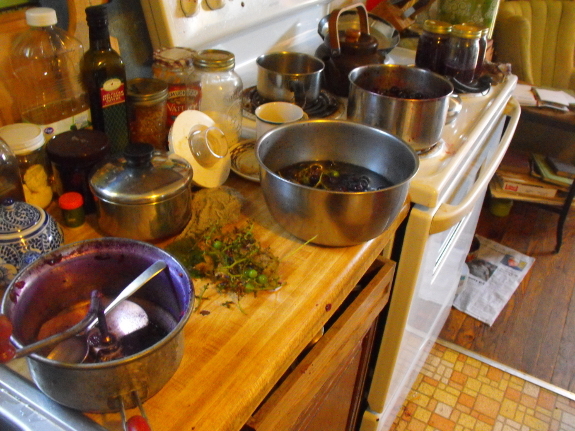 As I've written previously, it took some experimentation to figure out how to make cooked jams with no store-bought pectin, and I'm still working the kinks out of the process. This week's experiment involved lowering the sugar levels, and also mixing in smaller amounts of other fruits. I learned that pure white peaches will make a slightly-runny jam with two cups of sugar per batch (two cups of peach puree and two cups of apple-pectin juice), but I wouldn't want to go any lower with the sugar content if I expected my jam to set. Maggie gave me two cups of pulpy grape juice that she had laboriously harvested from her Concords, and I turned those into a batch of jam as well. 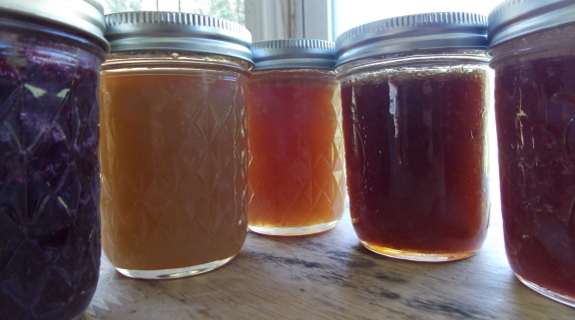 Adding two cups of apple-pectin juice and two cups of sugar resulted in a fast, thick jam, making me think that I could have cut back the sugar content. Or, better yet, mixed some of the grape juice with peach pulp for a tangy, well-set jam containing less sugar. Since I was making a batch of peach jam at the same time as the grape and didn't have quite three cups of the finished grape jam, I added a layer of peach on top of each jar for a very unique jam presentation. 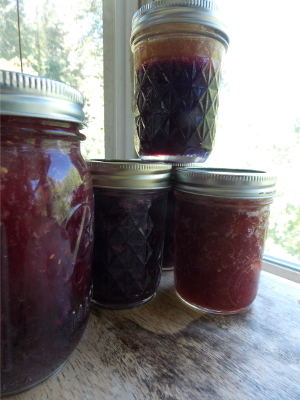 This jam layering didn't work as well with less-dense jams, though, so be forewarned. 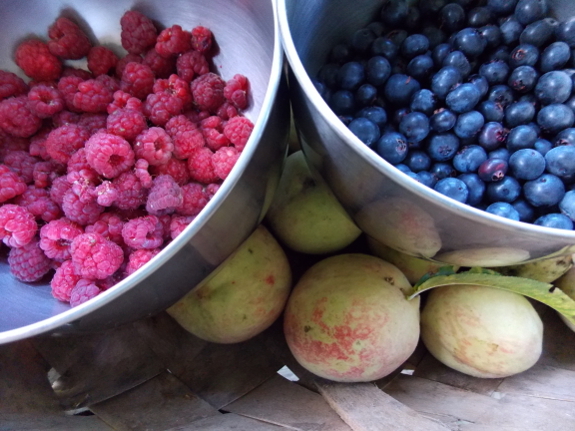 In the midst of all this peach-and-jam frenzy, I let the red raspberries and blueberries start to get away from me. So, Saturday, I mixed peaches and berries to make a beautiful, slightly-tarter jam (even though the sugar content was my now-standard two cups of sugar per four-fruit-cup batch). The red-raspberry/peach and blueberry/peach jams are still setting up, so I don't know how well they gelled, but they sure did taste delicious when I licked out the pans, and the colors are stunning. Although all of this experimentation has been fun, I'm definitely glad the last few peaches are in the fridge for fresh eating, with none left on the tree. I can't imagine having more than one tree producing at the same time, so take heed while planning your orchard! Our chicken waterer makes it easy to leave home for the weekend without worrying about your flock. Raspberries and blueberries (and strawberries, too) have enough pectin to set on their own - 4c fruit and 1c sugar usually works for me. Blueberries are very high in pectin, actually. A multi-berry jam with those would never need pectin, I'm thinking. Peaches and cherries have some of the lowest pectin levels. I giggled when I read that you lick out the jam pan...because I do the same thing. Can't let any of that liquid gold (gelatinous gold?) go to waste! Plus, like you said, you gotta taste-test it to see how good it is! Emily --- Excellent question! Unfortunately, I have no idea. What I ordered wasn't a white peach, so I'm guessing this was either a variety mixup or the rootstock sprouted and they didn't realize. Whichever, it's a very hardy tree! We got it from Clemson's Extension service (via my father). I can't find a list of their selections online, but the extension service does have recommendations for the backyard, and Belle of Georgia/Georgia Belle is the one that looks most like the one I have. So maybe that? Thanks for the advice to not plant more trees than you can handle the products therefrom. I am notorious for overplanting (everything) and then wasting so much of the bounty because I become overwhelmed. While I love a good ripe peach once a summer, I don't think I have it in me to eat peach jam all year. I may end up only planting potatoes and peanuts at this point.